First thing I’d like to start off saying is that everyone has their own specific account needs and this is a general how to guide specifically for your main Evony account. I hope that you find this helpful and you understand the concepts of this, as it has changed the game play of many. If you’ve read the articles about farming strategies you may have noticed it was mainly geared towards accounts that help provide you with resources. We will take a similar approach to that but we need to adjust it based on how you are playing. A very important thing I want to get across is stop trying to run more then one account as your main! That means you are not at full strength. I don’t care if you have great fields, great heroes, etc. Pick one single account and make it great! Move/swap cities around if you have to but get it set and go with one! If this city lands next to you is it worth defending with average troops? Do not fight when you are outmatched. Set up right and you won’t care! This is where you need to use your best judgement but what you want to do is make theses not worth hitting. Keep very low resources in them and minimal troops depending on the city’s task. 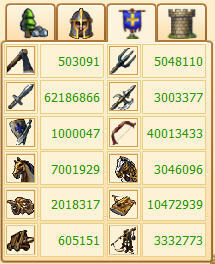 I run these cities with gates closed and all resources/troops are capable of vanishing with any attacks. This can be a game of honor and typically the person with the highest honor is losing. I avoid honor at all costs unless I know I can hurt the attacker in some way. I personally run and have always run seven cities total, the seventh being my war city. This makes you additionally a smaller target but gives you a lot of options for advanced tactics. What is great about these cities is they can be extremely good “bait” cities against an attacker trying to run loyalty waves, transports, mechs, etc. The idea is not to defend but have victory through resistance. I wont go through too many suggestions here but we have run main cities with a farmers setup but with 10k-20k ballistas instead. The basic setup is the same but we convert to a mech defense last minute by building abatis, reinforcing with scouts and opening gates. The goal here is to kill troops, capture heroes and damage egos. Attacking you should be a risk so make it one, avoid losing any troops, play gate games and have your defense disappear like it hasn’t arrived. I would recommend 1-3 Level 10 warehouses in theses cities depending on your population, rax and attack hero. Making sure you have a steady flow of troops moving to war city will be important. If you are running a farm hub, I’d have a main account directly next to a feeder account that is defended well and loaded with transports. This is going to move all your resources into your war city as well as supply cities with resources they need to build troops. The large majority of resources should always been moved to war city. Your war city is your floating city that has it all and can be anywhere at any time, committed to no location and ready to move. The truth is most of the biggest players on your server are doing this or some sort of variation. If you are not doing this you are spreading yourself thin across several cities and are weak everywhere. Any decently stocked war city will clear you with no issues. I know many players have had to deal with players bullying them around or their alliance. Why give these attackers a reason to even stop. I’m a huge fan of “deny them targets”. You will either be such a waste of time to hit or so massive that your average player will go running for help. I don’t like losing troops, especially if I am not on. Unless you are cornered by several players at once, this will give a lot of time to get notified and get help. The point here is you have to completely change your game. Instead of stressing about multiple cities, you concern yourself with a select one or two cities. No more losing massive troops at multiple locations trying to protect small amounts of resources. Not only do you have a stacked city protecting your troops but you have a war city! You have a city that you can defend, attack, port, truce, holiday etc. There is no shame in any option you chose, it is great strategy. By denying them targets they cannot steal much of your resources, kill many of your troops or get that fulfilling victory. It is hollow and they have very little to show for it. Never fight a fight unless you know you can win or cost them dearly.